Hundreds of taxi cabs—many of them brandishing anti-Uber signs—clogged a major roadway in Spain during rush hour Monday morning. 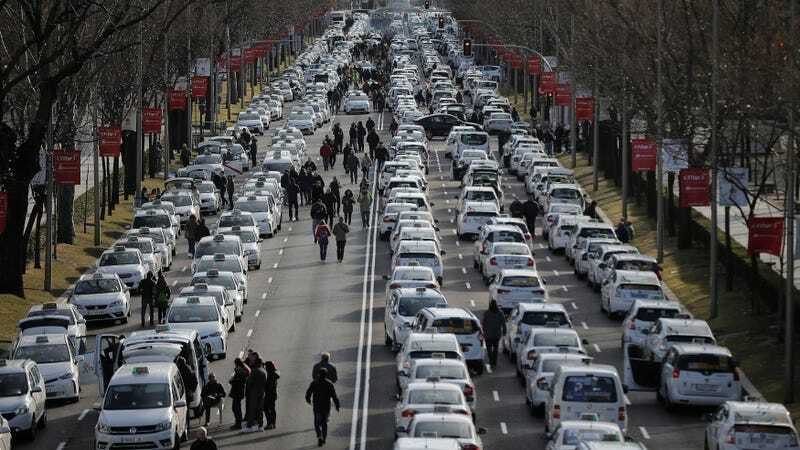 The coordinated parking lot in the middle of Madrid’s Paseo de la Castellana came at the beginning of the eighth day of a protest pushing for stronger regulations of ride-sharing services, namely Uber. Reuters called it the “biggest show of strength” by the protestors so far. Many drivers wore yellow vests, the same symbol worn by demonstrators in France. Riot police and tow trucks spent several hours clearing out the road. According to the Spanish news outlet El Pais, it took police two hours to clear out about 65o feet of roadway. The newspaper reports that some protestors accused the police of being unnecessarily violent in their efforts. The Associated Press reports that law enforcement claimed there were no major clashes, but also states that reporters noticed tense moments. Uber did not immediately respond to a Gizmodo request for comment on the strike. Barcelona taxi drivers ended a strike last week when government officials proposed new terms for ride-hailing services, including a stipulation that rides must be hailed at least 15 minutes in advance. The new regulations open up a possibility that the booking period could be extended to an hour. Madrid taxi drivers want their city to adopt ride-haling service regulations similar to those passed in Barcelona. According to El Pais, taxi drivers have claimed that other drivers from other cities are coming to Madrid to join the protests.